Hi I’m Chippenham children’s entertainer Ozzy Wizzpop. 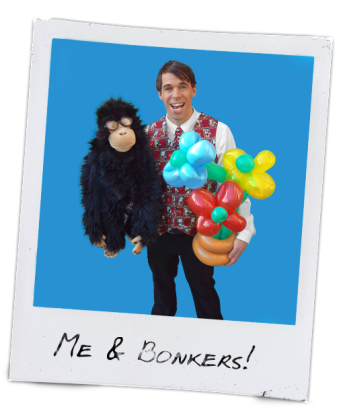 I offer a high-octane memorable birthday party entertainment with magic, talking puppets, balloon sculptures, party games and lots of comedy. I’m not just your standard magician you see at kids birthday parties. I’m a bolt of fun energy as soon as I begin performing. I’ve spent a long time in perfecting a show that children will never ever forget. I want them telling their grandchildren about this wacky guy called Ozzy they saw when they were little. When I structured my birthday magic show I planned it in mind considering that children have a short attention span. It is of paramount importance that I keep the children focused on the show for the whole duration. If they don’t enjoy it they will just loose attention. This isn’t an easy thing to achieve however after a quite a while of performing at children’s birthday parties around Chippenham and perfecting the show I seem to have got the hang of it just about right. I start the show with a powerful comedy warm-up. Once the children are laughing along with me from the start I have them on my side for the rest of the party. This warm-up achieves just that. I get them laughing hard! From then on I’m no longer an unfamiliar man standing in front of them but in their minds an awesome funny magic man. I use music from current children’s TV shows in this warm up. They really enjoy this as they can relate well to it, especially when Peppa Pig makes an audio appearance! Some peoples impression of a magician is that of a suited gentleman performing one mind puzzling trick after another with an air of superiority over the audience. This couldn’t be further from what I do. Yes I do have moments where the children are puzzled by the magic (which they delight in) but along the way I get it wrong, make funny jokes, get the children to shout things out and let them get the better of me in some way. It’s very pantomime-esq and it works very well with all ages. If your stuck for birthday party ideas then look no further.